Chinese athletes pose after winning women’s title at awarding ceremony of 2012 World Cup Taekwondo Championships. 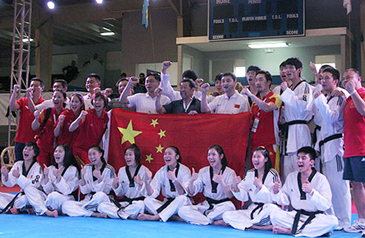 South Korea won the men's division title and China won women's division title, respectively at 2012 World Cup Taekwondo Championships held at the Centro Deportivo gymnasium in Santa Cruz in Calif. the United States on Nov. 25-7, 2012. In the men’s division, South Korea showed its supremacy as it defeated Iran 27-11 in the final match for top honors, drawing big applause from spectators. Korea reached the final round as it beat Spain 21-18 in a semifinal match, while Iran came from behind to beat China 19-18 to advance to the final round. China needed a third sudden-death round to brush aside a stiff challenge from France in the final match for the top honors. China advanced to the final match as it beat Croatia 17-15 in a semifinal match. France reached the women’s final match by beating Russia 21-9 in a semifinal match. Ms. Zhang Hun of China was chosen as the female MVP and Mr. Young Jin Kim of China was named as the best coach in the women’s division. Korea’s Kyeo-re Han was picked as the male MVP and Mr. Kye Hee Park was chosen as the best coach in the men’s division. Korean athletes pose after winning men’s title at awarding ceremony of 2012 World Cup Taekwondo Championships. Best Referee Awards went to Mr. Jorge Reynoso of Mexico, Mr. Mokake Moshoeshoe of Lesotho and Ms. Renata Crkvenac of Croatia. At the three-day World Cup Taekwondo Team Championships, which took place at the Centro Deportivo gymnasium in Santa Cruz, a Daedo Protector and Scoring System (PSS) was used. The team competition was composed of two rounds of five minutes. The second round was a tag match. A team consisted of five athletes and one substitute. The event drew 90 male athletes from 13 countries and 69 female athletes from 10 countries. The 13 countries were host Aruba, Iran, Korea, Spain, Russia, Egypt, Venezuela, Chinese Taipei, Dominican Republic, the United States, Brazil, Uzbekistan and China. The male teams were divided into four groups, of which the best two teams from each group advanced to the quarterfinal round after round-robin preliminaries. Host Aruba, Iran, Korea and Spain were seeded. The 10 countries, which sent their female athletes to Aruba, were Korea, China, France, Venezuela, Brazil, Croatia, Russia, Colombia, Chinese Taipei and the United States. The female groups were divided into three groups. Korea, China and France were seeded. At the same venue, the 3rd WTF World Para-Taekwondo Championships were held to a great success, drawing 53 para-athletes from 14 countries.